When Harold Hall was Editor of Model Engineer's Workshop magazine, he was surprised by how just so many of his readers had no access to a workshop at home, or even at college. 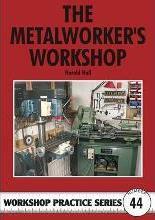 This book presents a complete guide to building or converting a workshop space and then equipping it to serve a wide range of metalworking activities including model engineering, model making, car restoration and clockmaking. It explains all the essential requirements of the workshop environment: planning, heating and lighting, condensation plus health and safety factors. It then explains in detail the choice of various tools and equipment for differing tasks so the new workshop owner can avoid making unwise purchases. The book is based on a very popular series of articles which originally appeared in the pages of Model Engineers' Workshop magazine, and which have been revised for publication in this edition. Purpose and Possibilities of the Workshop. The Workshop. Fittings. Planning. Hand Tools. Precision Tools. Shop-Made Tools. Electrics and Electronics. Machine Installation. Safety Equipment. The Lathe. Lathe Accessories. Drilling Machine and Accessories. Milling Machine. Milling Machine Accessories. Grinders. Motorised Saws. Presses. Sheet Metal Machines. Welders and Shapers. Final Comments. Harold Hall was for a number of years the editor of Model Engineers' Workshop magazine and through its pages, he established himself as a mentor to tyro model engineers worldwide. He is the author of seven books in the indispensable Workshop Practice Series and lives in the Hertfordshire countryside. Harold Hall commenced an industrial apprenticeship in 1950 at the age of sixteen and worked as an electrical control systems engineer for thirty-five years before becoming editor of Model Engineer's Workshop magazine in 1991. Following retirement in 1995, he has continued to contribute metalworking articles to almost every issue of the magazine published since then. His crafting hobbies extend beyond model engineering to cabinet making, modelling, marquetry and pencil sketching.